So as I fell in love with the world of art journaling, and delved head first into my own journal, it was only natural for me to start sharing each of my pages as I created them. But the more that I shared, the more disconnected I was feeling from the process. It became a cycle, a job, something I wished to not participate in any longer. So I pulled back, creating less and less. I wasn’t interested in creating art in a book. And as I realized this, I began to understand that I was treating it as I did all my other creations: as something to share with the world. When in fact, what I was craving was a sacred space… a place to call my own, to express myself fully without fear of judgment. This time knowing that it was only for me. Knowing that this journal was a place that I could hold dear to my heart. Knowing that this was a safe space to be ME. Knowing that it was okay to make something not worth sharing, because it was what my Soul wanted to express. Now, I almost hesitate to call it “art” journaling (and only continue to do so because it’s what everyone recognizes). Because the truth is, this isn’t ART. It’s what I like to call Creative Soul Expression. And the more you treat it as such, the more your Soul will feel free to fully express itself. So let’s make journaling personal again. Let’s grab our journals and hold them close to our hearts. And just to be clear, I’m not saying you should never share your pages. I’m just saying we should shift our intentions to making it safe, to making it personal. Work on a page for yourself, and see what comes out of you. Then, and only then, share as you see fit. Some you’ll be able to share, some not. P.S. 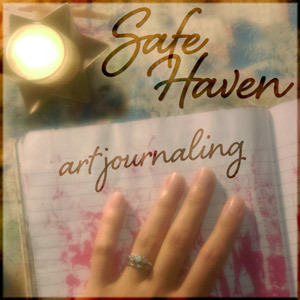 If you struggle with keeping your journal sacred, or simply love to share your pages but want a way to freely express yourself without sharing your thoughts with the world, join me in my mini self-guided class Safe Haven Art Journaling where we’ll explore how to set boundaries, build sacred space, and play with hidden journaling techniques – so that we can begin to see our journals as a safe haven to fully express ourselves. Phew, what a month it’s been! 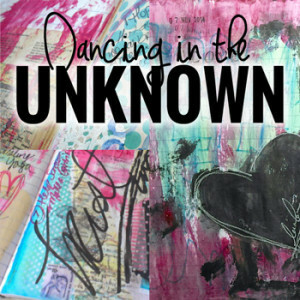 I left a lot of time open to film and write for my upcoming workshop Dancing in the Unknown which will be offered alongside 20+ other holistic workshops in Spectrum 2016. But of course half way through the month I lost all inspiration to work on it. I feel like the true intentions of art journaling are being lost within all of the available art supplies and tutorial videos out there. I wanted to build a space to hold a conversation around this. I wanted to share what I use in my own practice to hold my journal as a sacred place to truly express myself. And so, Safe Haven Art Journaling was born. If you’re interested in reclaiming your journal as your own personal safe space, join us to talk about setting boundaries, building sacred space, using an approach that makes us comfortable, and to play with hidden journaling techniques. Not surprisingly, as soon as I finished putting together Safe Haven, my inspiration returned to work on Dancing in the Unknown. And wow! What a rush it’s been! It feels like everything I wanted to share about uncertainty in our lives and facing the unknown and listening to our wise Soul voice is just pouring out of me with so much ease. Within this workshop, I share my experience along with two exercises you can practice to expand your comfort zone with the unknown to allow space to hear that wise voice within. Let’s spend time exploring the place where intuition and fear meet. I dare you to get curious about what your heart has to say and how it will guide you to make decisions aligned with your Soul’s purpose. CLICK HERE to learn more about this workshop, or go straight to the SPECTRUM 2016 workshop page to sign up for this collaborative experience (starts May 2!). I know you didn’t mean to cause such turmoil. But as you emerged within my journal, I was faced with so many thoughts and emotions that almost brought me to tears. That’s when it hit me – I was putting conditions on my love for you … when all you’ve ever done was bring me joy, and insight, and relief. What right do I have to withhold my love for you when all you did was become who you were meant to be? What right do I have to tell you who you should or should not be? You were created as an expression of my Soul. You are what needed to be released, what needed to be born. You are evidence that I have the magic to create something from nothing. You are the evidence of creativity flowing through me. You are the evidence of me honoring ME. I thank you for having the courage to be who you are without fear or shame, so that I may learn to do the same – flaws and all. I thank you for reminding me to enjoy the process of creating, releasing, and expressing; and to relish every moment I have to share with you. I thank you for showing me that there is much more in life beyond my thoughts, beyond my ego; and that there are discoveries to be made around every corner. And I thank you for unapologetically showing up when you knew you weren’t what I was hoping for, to remind me to celebrate where I am today instead of always looking to the future. I thank you for being that physical reminder of where I am right here and now, so that I may look back on my growth as a creative, as a woman, as a human, as a Soul. You have given me all of this and more. So I thank you. P.S. Perhaps you are beautiful after all. 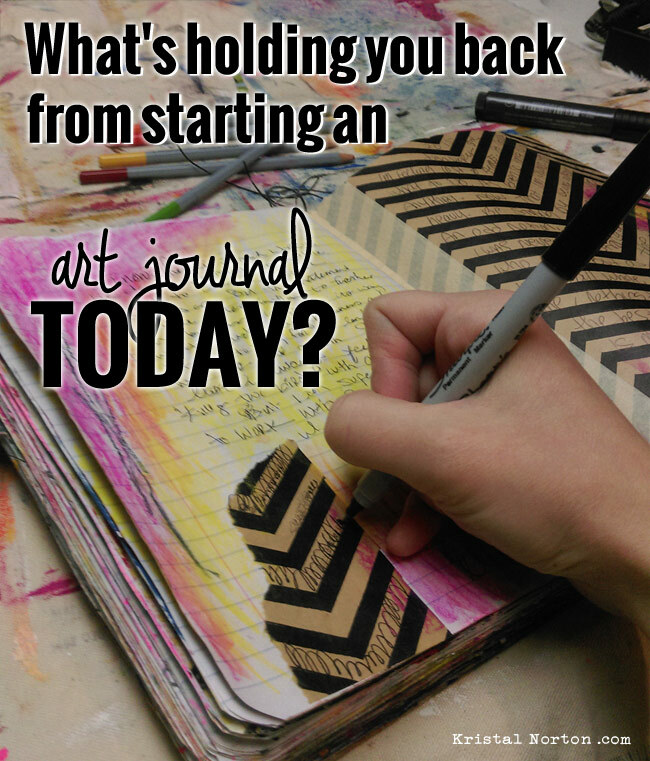 Time to Get Real – What’s Stopping you from Starting an Art Journal Today? So many women have come to me saying they feel the pull towards art journaling, but they’re waiting until things settle down. Or until they can save up for some supplies. Or until they can heal their bodies. Or until their kids grow older. Or until… whatever the excuse may be. But ya know what? 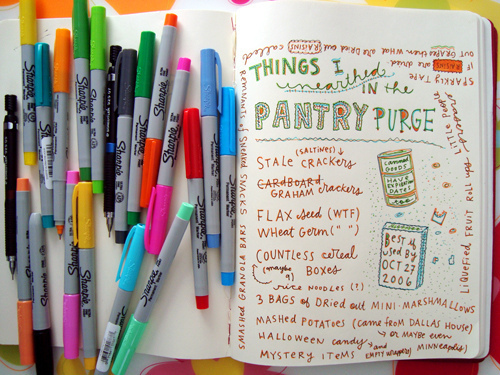 Art journaling doesn’t require any of those things. Think you need a ton of supplies? 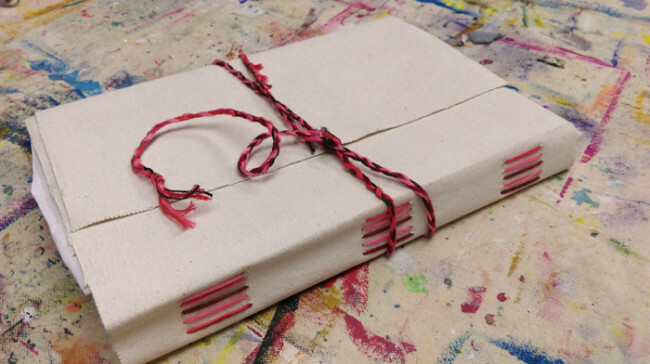 How about making a journal out of a few paper bags and some markers? Or cereal boxes and craft paint? Or how about an old book? One of my favorite ways to journal is with a $1 composition notebook and crayons. Just because the majority of art journals you see online are covered in high quality paint, gesso, glue, glitter, and the works; doesn’t mean yours has to. Short on time or always busy with the kids? When it comes down to it, if it were a matter of life or death, I’m sure you’d be able to muster up a few minutes of your time. 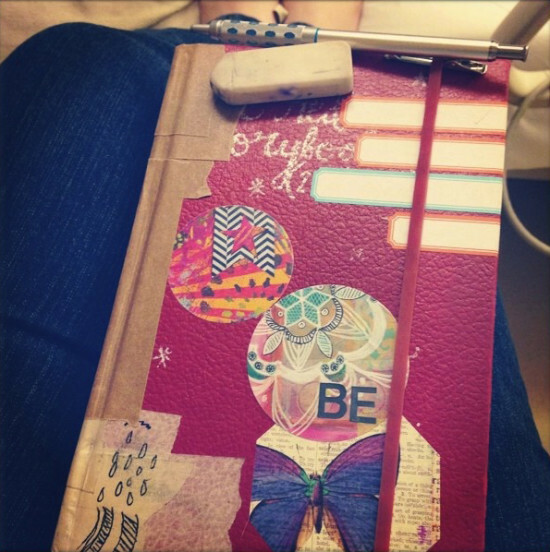 So perhaps the real issue is accepting the importance of art journaling or time to yourself. 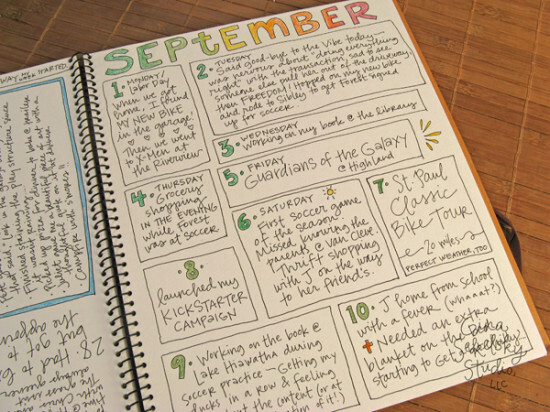 You can hear my thoughts on this and other tips on making time for art journaling here. I know this is a toughy. (And I can’t really speak from experience.) But there are many journal artists who create in bed or on the couch when they’re limited or in pain. Samie Harding shares some tips here on what she dubs “couch-art”. And as the saying goes… where there’s a will, there’s a way. What’s the real excuse here? Could it be fear? Fear of failure or that you’re not good enough? If you listened to my story, you’ll know that’s totally what happened to me when I fell in love with the idea of art journaling. I spent over a year watching youtube videos and flipping through pages of magazines, learning techniques I would never try. It paralyzed me with fear. Fear that I wasn’t worthy of doing it myself. That I would fail, and never be able to create such beautiful work as they could. Long story short, it wasn’t until I was able to move past these fears, put the focus back on myself, and start having fun that I was finally able to develop a fulfilling art journaling practice. I’ve shared many tips in the past about how to overcome these fears. But the very first, most important step in moving past any fear is to simply acknowledge the fear and show yourself some compassion. Start by being honest with yourself. What is your fear? What’s holding you back from starting an art journal today? Take a moment right now to practice courage and share your answer in the comments below. And remember… these fears? Are simply that. A feeling that you can work through. (You’ve got this!) And that feeling of not being good enough? Is totally wrong. You are good enough, because you are whole. In fact, you are full of infinite possibilities. 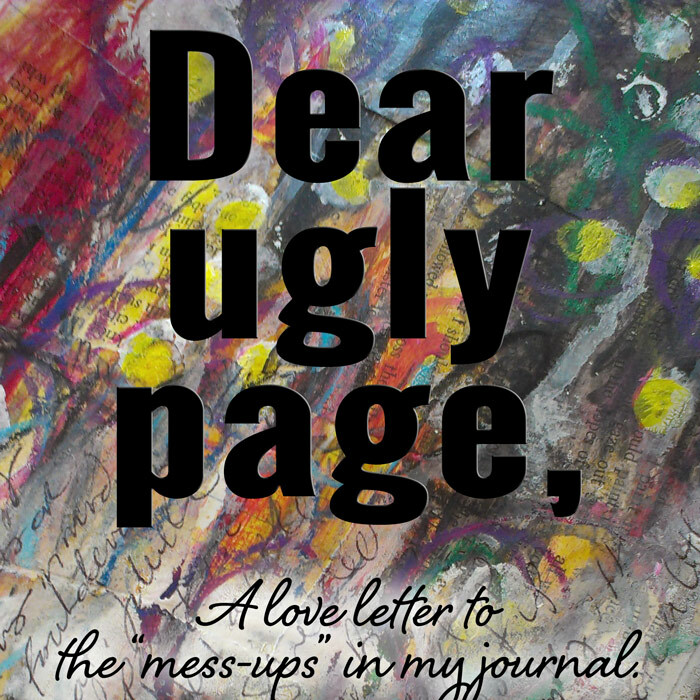 Still feeling stuck in starting that art journal? Why not delve into it with a supportive community and me as your guide. 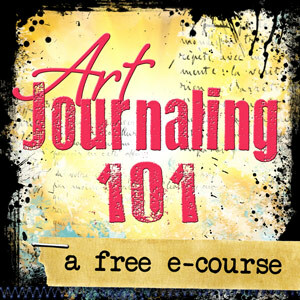 In my 6-week online e-course ROOTS, you’ll develop your own transformative art journaling practice as we let go of comparison and open ourselves up for self-exploration. Check out the information page HERE.